Yalla, Y'all! : Survey Results, Part 2! We wanted to find out what belly dance-related activities are students participating in, and how often. 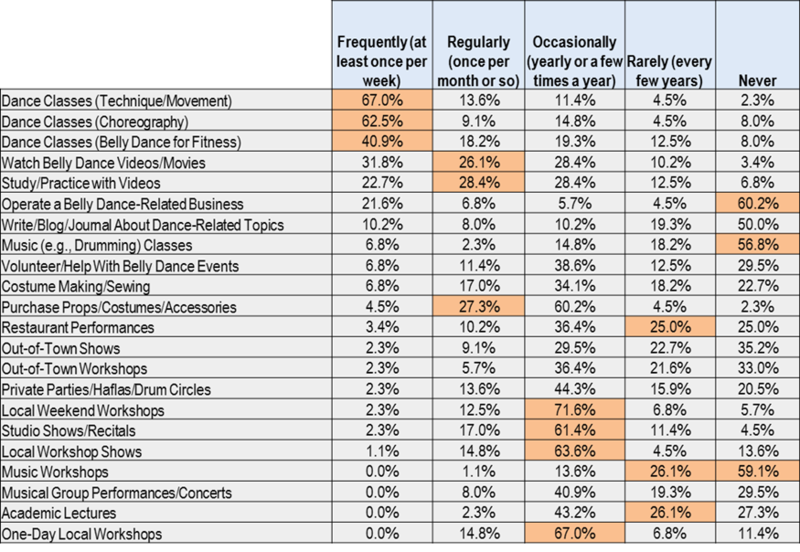 Not surprisingly, most respondents attend some sort of class on a weekly basis, with 67% taking technique classes, 63% participating in choreography classes, and 41% enjoying belly dance fitness classes at least once a week. (Interestingly, there was a percentage of respondents who rarely or never take classes.) Watching and learning from videos is also a popular activity. Be careful about when you schedule an event. Check my Calendar page, for starters! Be sure it's not competing with other big events (belly dance-related or not). Think about the location. I went to several great shows last year that were well outside I-285 and well worth the drive -- but not very well-attended. Team up with other studios. There's a lot of "coopetition" in the belly dance community, and even if you're competing for the same student base, everyone can win if you work together. Marketing, marketing, marketing. Use Facebook, Twitter, posters, e-mails -- get the word out to everyone as far in advance of the show as possible. Creating a Facebook event is a must. Consider using Facebook pay-per-click ads -- they can be very targeted (e.g., users in a particular metro area who are interested in belly dance). You only pay if someone clicks through, but if they don't, they'll see your copy and image for free! Have a landing page on your web site that is informative and compelling. A big part of marketing is not just the tactics, but the content. These tips seen very simple, but remember that you don't have much time to capture someone's interest. If your information is confusing, incomplete, inaccurate -- or appears less than professional -- you may lose their interest right away. Be sure your messaging is clear, complete, and accurate. Check the details like spelling and dates before you publish your communications. Use professional-quality photographs whenever you can (with credit to the photographer where it's needed). Get the details right the first time so you don't have to try to re-educate your audience if you make a mistake. And really think about what it is about your event that is going to make people want to see it. Any special guest performers? Is it a fundraiser for a good cause? Live music? Emphasize the differentiators! 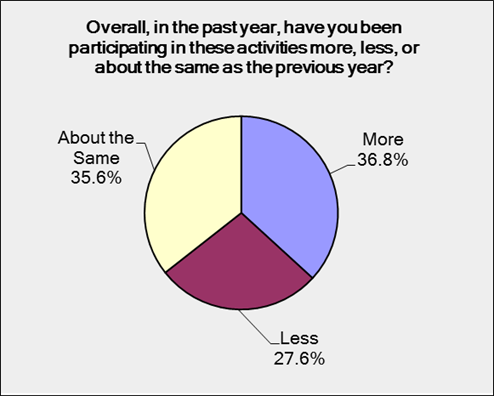 One of the most surprising results of this survey was the response to the question (referencing the above activities), "Overall, in the past year, have you been participating in these activities more, less, or about the same as the previous year?" With the obvious declines in class and event attendance that most teachers and event producers have been experiencing, we would expect that a majority of respondents would answer "less." However, only 28% of respondents said "less." A strong majority, 73%, said they are participating more or at about the same frequency as in 2010. So what does this mean? The metro Atlanta market is fairly saturated with options for belly dance classes and events. Our Links page lists a whopping 40 instructors and studios, most of whom were actively offering classes and private instruction in 2011. Several new studios have opened in the past few years, and several new teachers have entered the scene. My hypothesis is that the belly dance student population is not growing substantially, but the growing number of options is diluting the market. New studios in new locations may be drawing business from more established studios. The good news is that belly dance enthusiasts continue to participate in classes and events. 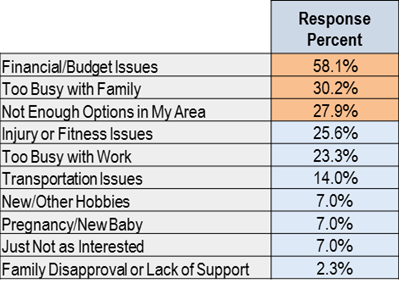 We asked those respondents who said they spent less time on belly dance activities in 2011 to list the reasons for this decline. 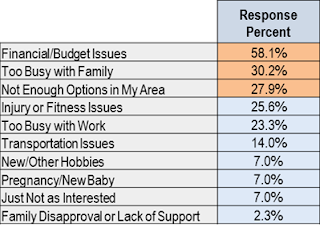 Not surprisingly, most said that financial issues kept them from being more involved. Many also indicated that they were just too busy. Some respondents from areas outside metro Atlanta and the outlying suburbs expressed frustration at the lack of options in the area where they live. Most of the activities listed do not exist in my area at all! What do students want more of? What makes students love belly dance? What are students' goals for this year? Bellydance by Samora Show at Nicola's Tonight! Alicia is Coming This Weekend! I've been studying belly dance in Atlanta, GA since May 2002. In that time, I've become acquainted with many of the amazing people who practice this art form in the Southeast and beyond. My goal with this blog is to provide a central location for events and news about belly dance in metro Atlanta and beyond -- all styles!